Sodium, more commonly called salt, has crept into more of the foods we eat. Salty snacks, like potato chips and pretzels are obvious. The Centers for Disease Control and Prevention, however, found that sodium is a chief component of many foods we least suspect, such as bread, cold cuts and canned soups. Salt may enhance the flavor of food, but it does not do much for our health. Sodium contributes to elevated blood pressure, which can result in a stroke and heart and kidney failure. The American Heart Association recommends consuming no more than 1500 milligrams of sodium a day for middle-aged and older adults, African Americans and people with high blood pressure. This amounts to about two-thirds of a teaspoon of salt. Some spices, on the other hand, may have health benefits. 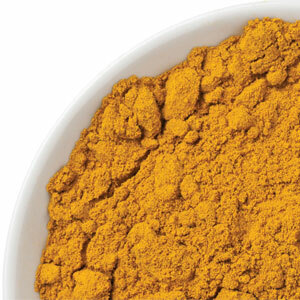 Turmeric, often referred to as “Indian solid gold” gives foods their yellow-orange color as well as unique flavor. It is the main spice in curry and is frequently used to flavor mustards and other condiments. But it might offer a bit more. Turmeric has long been used, especially in the East, to treat a variety of conditions, including arthritis, liver problems and skin conditions. More recently in this country, turmeric is being investigated as a possible treatment for cancer. Turmeric is an antioxidant, which can counteract the damage caused by harmful molecules called free radicals. This damage can result in cancer. Researchers have found that curcumin, the chief ingredient of turmeric, may prevent cancer, slow the spread of cancer and make treatment for the disease more effective by reducing the dosage and toxicity of chemotherapy. Two recent studies suggest that curcumin is effective in treating head and neck cancers. This research is in its infancy. Regardless, turmeric is considered a healthy alternative to sodium to give flavor to foods. 2. Place chicken in a 9x9 baking dish and pierce chicken pieces with a fork all over. 3. In a small bowl, whisk together lemon juice, yogurt, garlic, cumin, paprika, turmeric, ginger and pepper. 4. Add mixture to chicken, turning to coat, let stand 20 minutes (or refrigerate overnight). Bake for 15 minutes, turn chicken and bake 15 minutes more. 5. While chicken bakes, prepare rice to package instructions. 6. 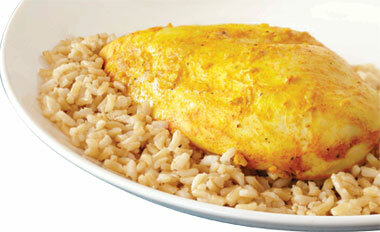 Serve chicken over rice. For more recipes visit heart.org/simplecooking.